Michael Clarke has defended Phillip Hughes against Ian Botham’s accusation of cheating and also cleared Ian Bell for not walking to a ball he was later shown to edge. Hughes was unsure whether he caught Alastair Cook at short leg, momentarily celebrating the dismissal before asking whether it had carried. Mitchell Johnson wants umpires to call no-balls immediately after Australia were the victims for the second consecutive Test when a front-foot decision was referred by an official. Michael Beer was celebrating Alastair Cook as his first Test wicket when Billy Bowden asked for – and then received – confirmation that the debutant spinner had over-stepped. “If the umpires know it’s a no-ball I think they should call it, instead of waiting to call it,” Johnson said. 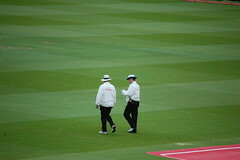 Bowden had a hunch Beer had gone over but he waited for the catch to be taken at mid-on before requesting a replay. Mitchell Johnson did his best to keep Australia alive in the final Ashes Test with a vital half-century and two key wickets on an absorbing day, but England were handily placed on 3 for 167 in reply to 280. Andrew Strauss hit a sparkling 58-ball 60 to launch England’s reply following Johnson’s counterattacking 53, then Alastair Cook maintained his prolific form only to lose Kevin Pietersen shortly before the close.